Deep in the forest there is a castle, high upon a hill. Abandoned decades ago, its gates have remained sealed. Now, an evil is leaking out and the villagers living close have felt its effects – death stalks their homes. Three adventurers happen upon this place – a wizard, a thief and a warrior. Unable to resist the challenge, they set forth to uncover the secrets of the castle. Within its walls, creatures have awoken and they thirst for blood and death. The heroes of this tale are not frightened of the unknown, but they must face the most powerful of adversaries in order to purge the place of evil. With swords and spells at the ready, they prepare to seek answers and their fair share of loot. 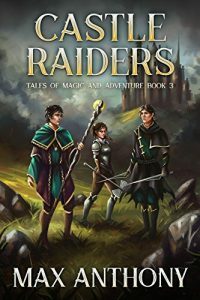 Castle Raiders is part of a series but can be read as a standalone book.